Free radicals and reactive oxygen species (ROS) are highly reactive molecules that are generated by normal cellular processes, environmental stresses, and UV irradiation. ROS react with cellular components, damaging DNA, carbohydrates, proteins, and lipids causing cellular and tissue injury. Excess production of reactive oxygen species can also lead to inflammation, premature aging disorders, and several disease states, including cancer, diabetes, and atherosclerosis. Organisms have developed complex antioxidant systems to protect themselves from oxidative stress, however, excess ROS can overwhelm the systems and cause severe damage. 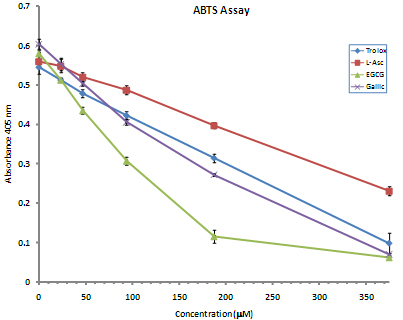 The ZenBio ABTS Antioxidant Assay Kit can be used to determine the total antioxidant capacity of biological fluids, cells, and tissue. It can also be used to assay the antioxidant activity of naturally occurring or synthetic compounds for use as dietary supplements, topical protection, and therapeutics. The assay measures ABTS.+ radical cation formation induced by metmyoglobin and hydrogen peroxide. 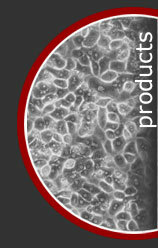 Trolox [6-Hydroxy-2,5,7,8-tetramethylchroman-2-carboxylic acid], a water soluble vitamin E analog, serves as a positive control inhibiting the formation of the radical cation in a dose dependent manner. The antioxidant activity in biological fluids, cells, tissues, and natural extracts can be normalized to equivalent Trolox units to quantify the composite antioxidant activity present. This assay measures radical scavenging by electron donation and when combined with ZenBio's ORAC antioxidant assay kit, provides a comprehensive analysis of a test sample's antioxidant activity. Trolox, Sodium L-ascorbate (L-Asc), Epigallocatechin gallate (EGCG), and Gallic acid (Gallic) were tested for their antioxidant activity in the ABTS antioxidant assay.